Mrs. K. Schuiling to Mr. S.J. Hoogland. I was very pleased to read in your letter that you are so well. I am well too, once and again I am a bit troubled by rheumatics in my left foot but on my photo you can see it hinders me not much. Thies and his wife and Clarence went to Modesto last week. The photographer in Modesto, who made photo's of me, will also make photo's of Klaas portrait. We only have a snapshot of him. Well, I asked the man if he could take a photo of that snapshot and he said it was a lot of work, it has to be worked out with a paint-brush so the first portrait would cost 3 dollars, would I order more than a dollar each. So I had him made one at first, then we could see how it looks. We were very surprised that he made it so well thus I ordered more. When they are finished I hope to send you one. The children also like to have [a portrait] of Dad. Ytje's husband said: even if it would cost two dollars a piece! They all want to have a photo of Dad. All the family is healthy as far as we know. Clarence of Thies and Anna is also recovered, a few weeks ago he needed surgery, it was appendicitis. The doctors thought surgery was necessary, in the morning Anna and I went to the doctors in Modesto with him. They [the doctors] would keep him in the hospital that very moment but Anna first wanted to hear what Thies said. That same evening they brought him to the hospital and he had surgery at once. Now he is as bright and healthy as he can be. Thies and Anna have only one [child], so our worries were big. Roelof and Fanny have no children so Clarence is the only son and heir till now. Jaantje was here two weeks ago with both her girls. We hope number 3 will be a boy, she feels fine, I hope everything will be fine. 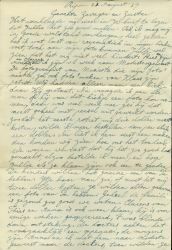 She told me that she had written a letter in Dutch as good as she was able to do. They each promised me to thank [you] for the handkerchiefs, the one who cannot do it in Dutch should do it in English. Then Aunt can ask their nephew if she don't know what is written. I also wish to thank you for the handkerchiefs, I use them frequently. I read a paper which is printed in New Jersey, Mr. Lont, who lived in St. Anna[parochie] before, is the editor. The registrar's office of Friesland is in it. So I learned from it that Roelof Hoogland's wife passed away and Liesbeth Postma, widow Bos. 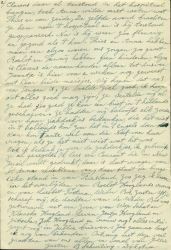 Sister Ytje wrote me the daughter of widow Bos is married to a son of Wop Schat and Klaaske Hoogland. Are Jentje Hoogland and Jitsche, Joh[annes] Hoogland and wife still alive? Everything interests me in Your letters, I still like to read about old well known people. Receive with this many greetings from all of us and most from Your Sister B. Schuiling-Dijkstra. Mr. and Mrs. Dirk Van Konijnenburg.